Status: offline Jeep, I can't remember exactly where I read it, as I have been reading a lot lately, and I think it was Skoyles and Sagan's Up From Dragons... but it has been recorded that something like 20% of people have no palmaris longus at all, and a much smaller percentage have two adjacent PLs, not necessarily on both sides. L6 is an extra Lx vertebra, present in a fairly low percentage (sorry, can't recall the figure) of people, which may or may not sacralise. Is that what you mean? Perhaps the genes get a bit fuzzy for some and an extra thing is added or taken away. Status: offline I am going to give this just a few more days and then post the findings. Everyone is correct with the fabella. It is WNL for this case. Status: offline My wife walked by and guessed a superior-posterior displacement of the fibula. and I think the tibia looks a little weird too, it looks like it is sharp and extends out too far. Maybe a torsion. 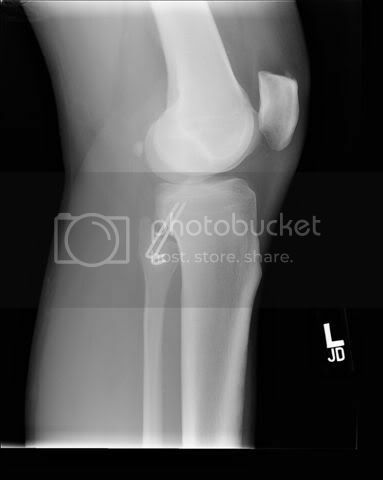 Status: offline There appears to be some edema on the first film superior to the lateral chondyle and the quad tendon attachment seems a bit odd at the patella with some soft tissue changes. I am not sure what the technical jargon is though. Status: offline The proximal fibula is laterally dislocated. No evidence of fracture. 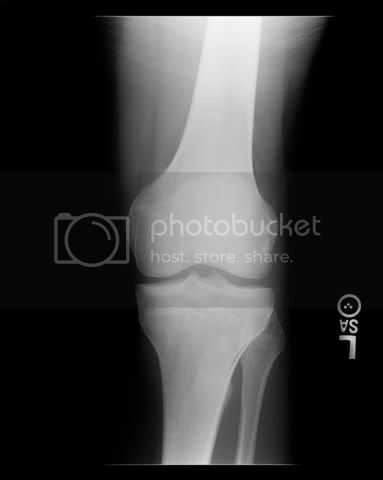 I posted a radiograph below showing the normal relationship of tibia to fibula in the AP view. There should be some overlap of the fibula and tibia as seen below. The lateral view is also helpful but we were unable to get a true lateral view. The patient was tender to palpation over the fibular head and there was soft tissue swelling only laterally. He had pain over the lateral knee with passive extension. The dislocated fibula was easy to palpate. 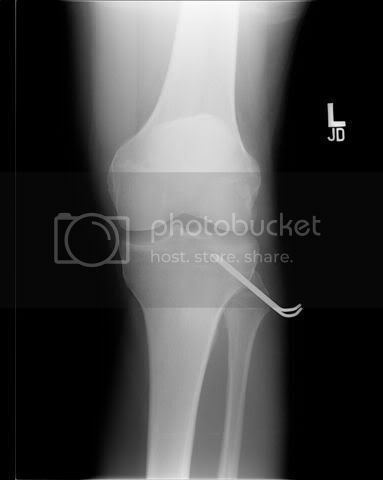 A physician assistant and I tried to relocate the fibula using local anesthetic but we were unable to budge it. He was sent to an ortho surgeon who was able to relocate it in the OR. This is the first one of these that I have ever seen. Which structure over the lateral knee would you be most concerned about when trying to relocate the fibula? Good job to SJBird and to Randy Dixon's wife. Did he get any deep peroneal nerve problems afterward? Status: offline Thanks for the update Alex. I would think the peroneal nerve could be affected if they tried to relocate the fibula. Status: offline i agree with the peroneal nerve concern when reducing the fibula as stated by jma. Status: offline You are correct. The fibular nerve (new anatomical name for it) would be the structure that you would be most concerned about. Here is a pretty good article that relates well with this case study. "Instability of the Proximal tibiofibular joint". Sekiya JK, Kuhn JE. Journal of the American Academy of Orthopaedic Surgeons. 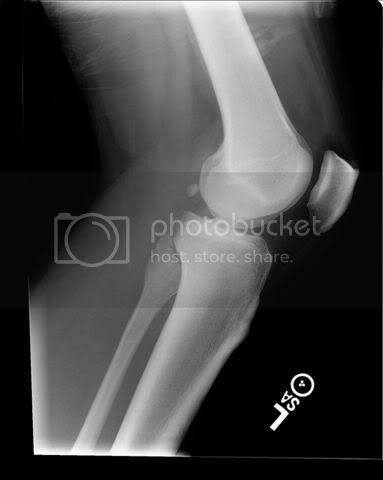 Vol 11, No 2, March/April 2003.
they quote, "Plain film radiographs should be taken of the knee in true anteroposterior and lateral views. Comparison radiographs of the contralateral knee can substantially improve the ability to diagnose instability of the proximal tibiofibular joint. On the lateral view, the fibular head overlies the posterior border of the tibia. Resnick et al described a line on lateral radiographs that follows the lateral tibial spine distally along the posterior aspect of the tibia and defines most posteromedial portion of the lateral tibial condyle. In a normal knee, this line is found over the midpoint of the fibular head. In anterolateral dislocations, the fibular head will be anterior to this line on the lateral view. In posteromedial dislocations, all or most of the fibular head is posterior to this line on the lateral view." See below. 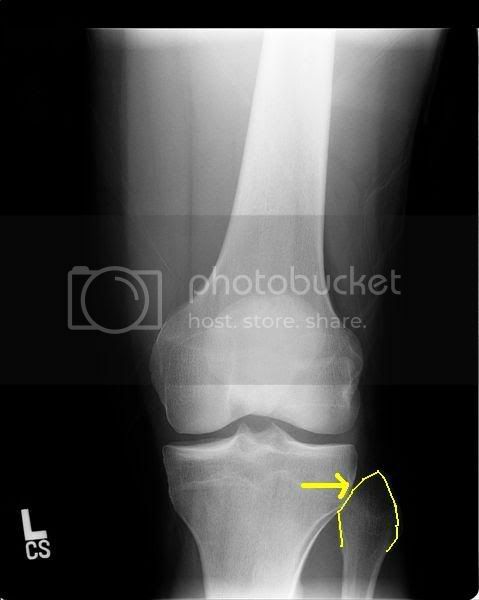 Above: Lateral radiograph of a normal knee indicating Resnick's line (yellow) for identifying instability of the proximal tibiofibular joint. In this knee, the line is near the midpoint of the fibular head. Status: offline Thanks for the reference and the highlight on the radiographs. Makes it easier to see. Was not aware of this. This was not even mentioned in the radiology class I took not too long ago. Nice to know about it now. Keep them coming! This gentleman was seen by ortho surgery and underwent this fixation. He currently has no pain and has begun a slow walk to jog program. Status: offline Looked like reindeer antlers in there if you ask me...you sure this wasn't the same guy with the locking shoulder? ?